Maine took the brunt of this winter storm with widespread 1-2'. Carroll County in NH was the big winner in the Granite State with most locals reporting 12-18". The storm did disappoint in Western NH and Vermont thanks to its rapid forward motion. That rapid forward motion also eliminated any chance for the 2-4" I called for as the rain finished as snow last night. I should have just stuck to my coating up to 2" after the storm. Northern Worcester County did well as Fitchburg clinched the MA State Title with 10.8" for this storm. Congratulations to the Red Raiders on the well deserved honor. Worcester and Hartford (Hartford is measured in Windsor Locks, CT at the airport) are pace for an average to above average snow season. Providence and Boston are currently bringing up the rear. This has been the trend for snowfall this season. 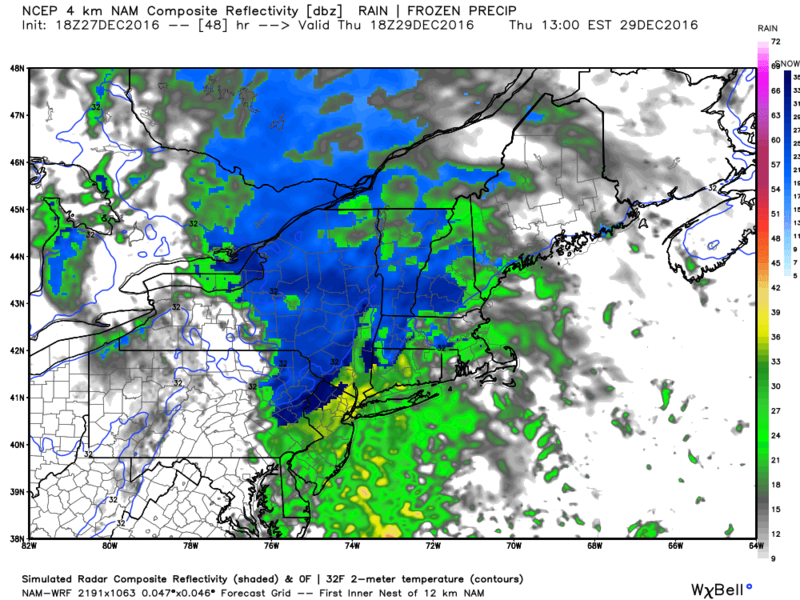 Lows cut to our west and switch snow over to rain in the Coastal Plain. Ocean temps are still running in the mid 40's so any easterly wind off the water is a snow killer. The low is now in Northern Maine and is exiting the New England weather stage. As the low departs and high pressure builds winds will occasionally gust to 45 MPH out of the west northwest. The National Weather Service has issued a *Wind Advisory* until 5 PM tonight. Max temperatures will climb into the mid 30's amid mostly sunny skies. The winds will make it feel like temperatures in the low 20's so please be aware of that. Winds drop a little bit tonight but they will still gust to 30 out of west. With air temperatures in the low 20's wind chills will dip into the teens/single digits. Clouds will increase tomorrow but the day will be dry. Winds flip to the south and temperatures rise into the mid 30's. A disturbance will pass through Northern New England New Years Eve night. 1-2" is possible between 6 PM and midnight in Worcester County. Some light rain is likely in the coastal plain as temperatures are marginal for snow. Temperatures on Sunday are right around 40 with calm, sunny weather. A powerful sub 970 mb low will skirt across Eastern Massachusetts into the Gulf of Maine Thursday night. The low will move into Downeast Maine Friday AM. Heavy snow will fall in Central and Northern New England away from the coast in all the big ski/snowboard areas. 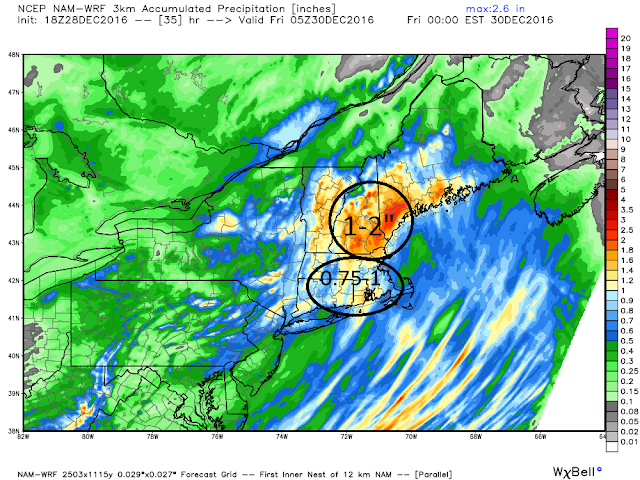 Heavy rain will fall in Southern New England for much of the storm. A change to snow late Thursday night could give Southern Worcester, Metro Springfield, and Northwest Middlesex county into Essex county 1-2". Wind will gust 40-60 mph as the low deepens and moves through our region. Temperatures tonight will dip into the upper 20's as high pressure moves east into the Atlantic. Winds will be light and skies will be party cloudy. Temperatures are cold enough to support snow when it starts around 10 AM. The atmosphere will be able to support snow in the western 2/3 of tMA through noon time before a change over to rain. The rain snow line may jog back forth in the 495 belt from Essex County to Worcester and then over to Springfield through early afternoon. 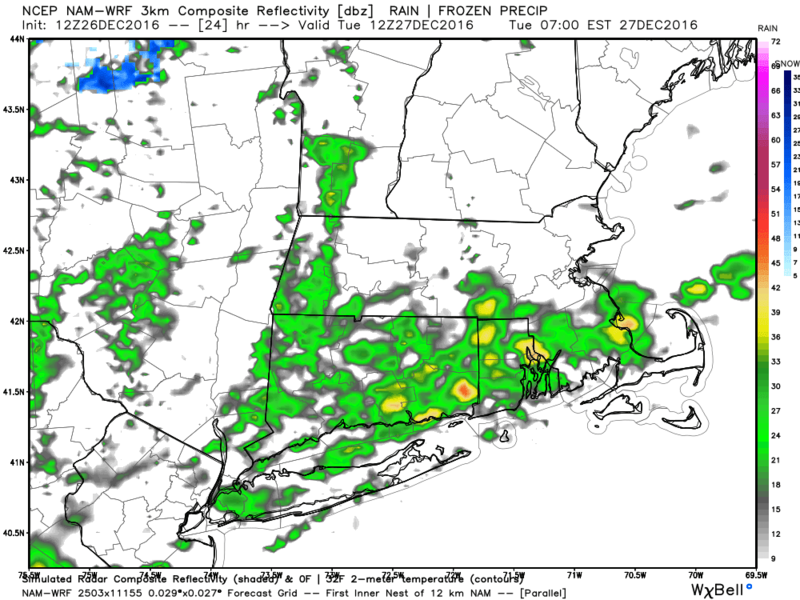 Plain rain to start in SE MA/RI/CT. Here is the simulated radar for tomorrow evening/ Notice how the rain snow line progresses well into Southern New England and even into New Hampshire. However the line will collapse back to the coast after 8 PM. Snow adjacent to the rain snow line will drop 1-2" in the Blackstone and Merrimack Valleys of MA. 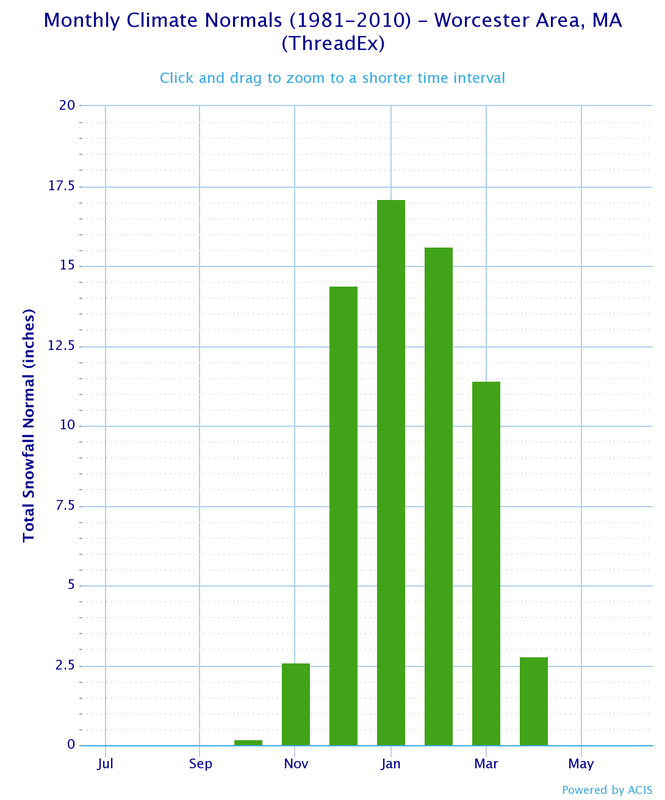 Total precipitation is 0.75-1.0 in Southern New England. Winds will be strong at times as the low crosses Southern New England. Minimum pressure will be around 980 as it crosses SE MA between 7-9 PM. Winds will be strong along the South Coast with 50-60 mph winds. 35-45 MPH winds are likely in the rain bands. In SE NH and ME this will pose a power outage problem as high winds and wet snow on tree branches are a bad combination. 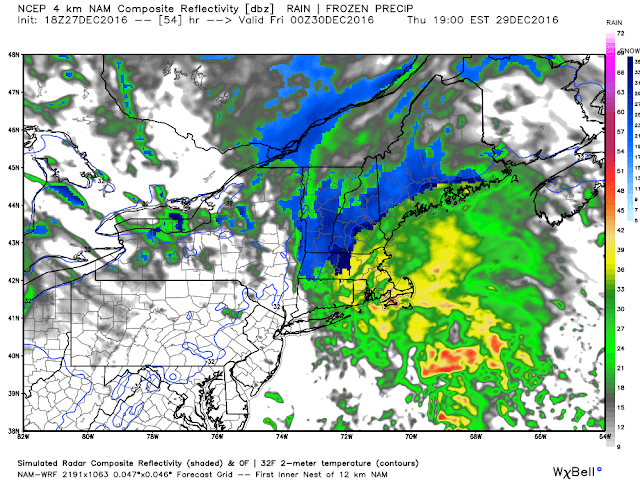 As this low bombs Friday AM into Southern Maine it is modeled in the 960s! This is a strong storm that will produce high snow totals in Northern New England, strong wind gusts in Southern New England and a combination of both in between. Winds subside as the low moves away and high pressure briefly moves in. Max temps will be in the 30s. Low temperatures Friday night will be in the upper teens and low 20's. Saturday is seasonable with temps in the low 30's. New Years eve has a slight chance of snow showers and temperatures in the upper 20's. It's not a Southern New England blockbuster storm but who wants to waste those during a week of vacation? There are two main ways to lock cold air into Southern New England before a big snowstorm. Neither will be present on Thursday but a decent snowstorm is on the way for interior Southern New England/Northern New England. Low pressure will track over the Canal allowing a surge of warm air to move into Eastern MA/RI/CT. The inland track will change these regions to rain. The low will deepen rapidly as it swings into the Gulf of Maine. Temperatures will drop sharply as this happens and a brief burst of heavy snow is likely in interior Eastern MA, South Central MA and Northern CT. 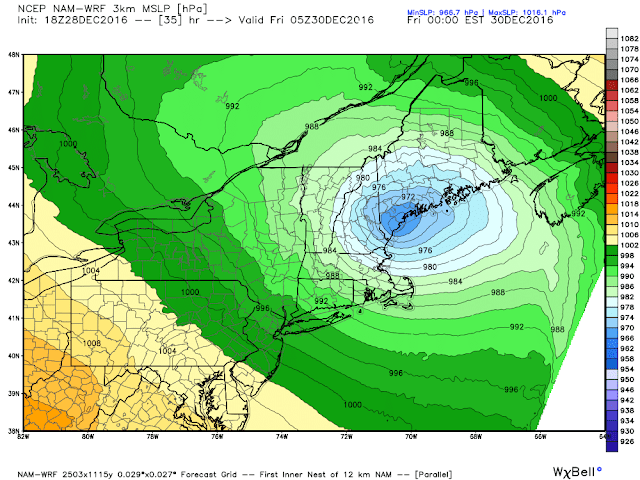 The deep pressure drop will also bring strong winds to Southeastern New England. Nor is it present on its own as it was on January 27, 2015 in my personal favorite blizzard. The high is important to lock cold air into Southern New England. It is also important that the low pressure center track offshore of Nantucket near the 40/70 benchmark. With no cold air to lock in and a low track over Southeastern MA the big ingredients for a big snow are missing from the atmospheric recipe. On Thursday AM the initially weak surface low makes it way towards the Mid Atlantic coast. High pressure is in the picture for the time being but it will continue to move east on Thursday. A mix of snow and rain will move into Southern New England Thursday between 10AM- Noon. 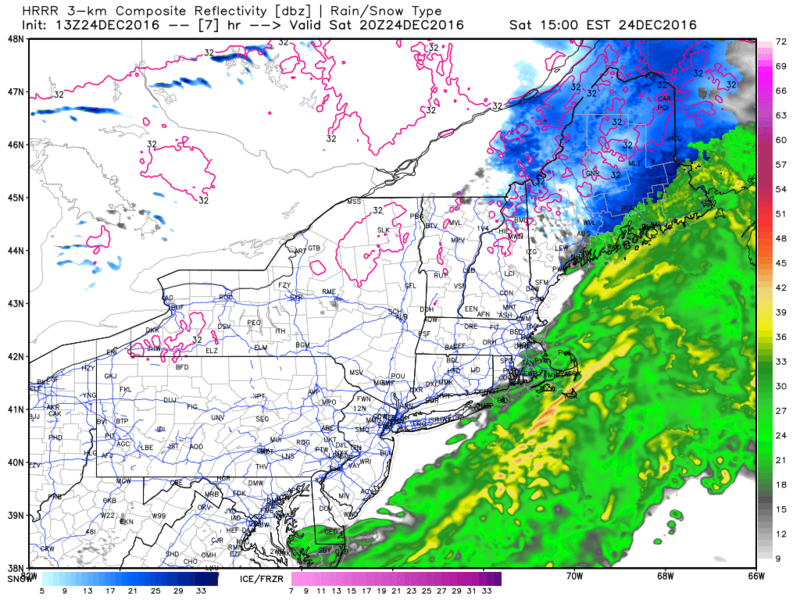 Expect steady snow in Southern NH, VT, and Western MA by this time. Rain will be steady in Southwestern CT and on the move east. At this point the rain snow line will be messy. Given the strength of the low crossing the region and temperatures in the low to mid 30's intense precipitation may change over to snow. That is what I will be watching over the next 48 hours. 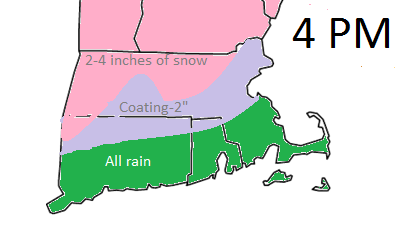 A *Winter Weather Watch* has been posted but rain and wind is likely to be the main players South of the Pike and inside 495. I expect Southern Worcester and Northern Middlesex to be placed under Winter Weather Advisories for this event. The rest of interior will post Winter Storm Warnings. A *Freezing Rain Advisory* has been issued from 3-11 PM this afternoon. 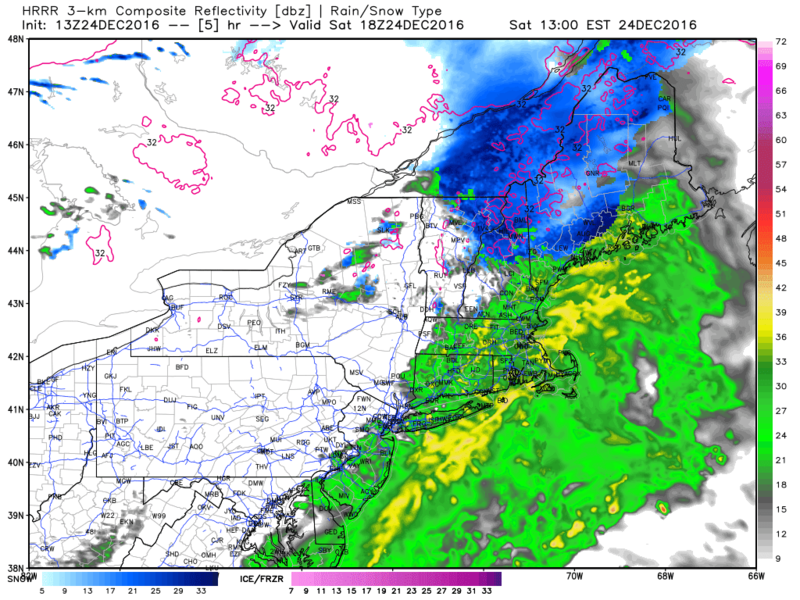 Precipitation is entering New England as of 2 PM ahead of a warm front. Temperatures will surge into the 40's and 50's in Central and Eastern MA, RI and CT tonight ahead of the cold front. A *Wind Advisory* has been posted for S RI and SE MA as the warm surge will be accompanied by 40-50 MPH wind gusts. Some rain showers will accompany the cold frontal passage Tuesday AM. The current Northeast radar loop shows some showers ready to move into Western New England. Temperatures are in the low 30's in Central and Eastern MA and RI. The CT River valley is also in the 30's. 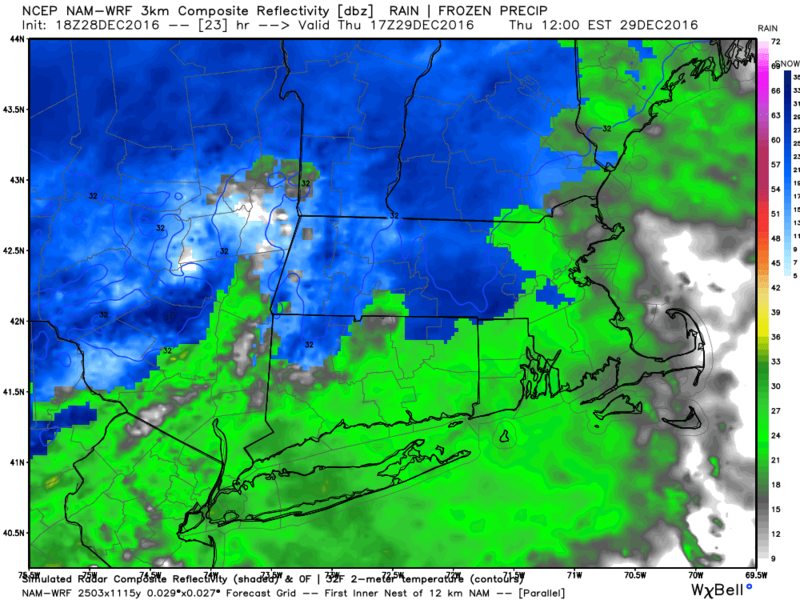 As this first batch of enters Western MA it will start as sleet and freezing rain. This precipitation will reach Worcester, Providence, and Boston between 430-630 PM. Here is the US surface chart for 7 PM this evening. This storm is the same complex that brought blizzard conditions to the Dakota's on Christmas Day. It will be windy in Central and NE MA, N RI even though there is no advisory at the moment. At 7 AM there will be a band of rain across Southern New England as the main cold front passes. Temperatures are in the mid to upper 40's in interior SNE and low 50's in SE MA. Rain is gone by 1030-11 AM throughout most of the Commonwealth. Temperatures fall into the mid 20's Monday night. I am watching a storm for Thursday PM into Friday AM. Rain and snow are both options as of now. It is dry for the champions already tailgating for the Pats-Jets game today. This will change in the next 1-2 hours and rain will continue through the first half of the game. Coach Belichick often defers to the 2nd half when the Patriots win the coin toss. If you have anything to do outside it would be wise to make a similar choice. Skies will clear this evening so Santa will not need Rudolph in the Northeast but he will in other parts of the country. 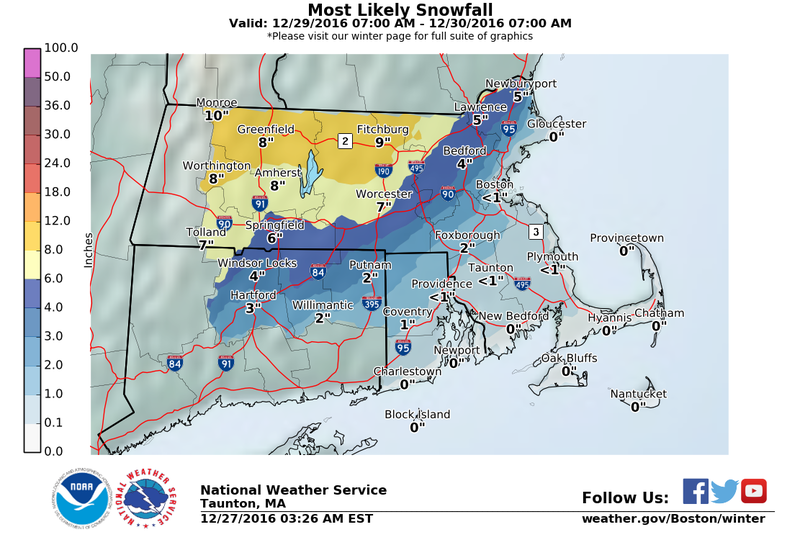 The National Weather Service has issued a Winter Weather Advisory for Northern Worcester County and the rest of Western Mass. Northern CT with the exception of Windham County. Freezing rain would appear to be the biggest threat at the higher elevations so if your holiday travels take you west drive carefully. Temperatures are hovering near freezing outside of 495 and north of the Pike to 395. The cold front that will bring the rain to SNE is moving quickly. It has started as snow in Southwestern Worcester County but this should flip to rain very quickly. Circled in the Southwest is the most important weather maker for the country during the next 48-72 hours. The arrow in Canada is a shot of cold air for Christmas night. Here is the regional radar as of this AM. There is plenty of precipitation to fall in the next few hours. Somewhat amazingly, considering all the NFL teams based in the Northeast, the Pats-Jets is really the only game to feature bad weather today. The Giants/Eagles played Thursday, the Jets are obviously on the road, Buffalo is clear, Pittsburgh-Baltimore play tomorrow and the Redskins are in Chicago. Here is the simulated radar for 1 PM. But look at this. 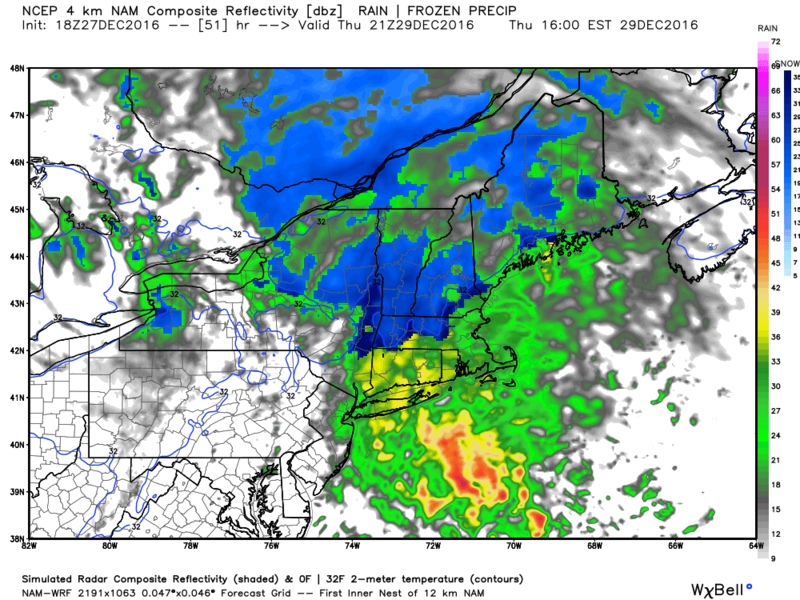 By 3 PM the rain is pretty off the SNE coast. Max temperatures today top out in the low 40's. Temperatures tonight drop into the upper 20's as clear skies allow the atmosphere to cool efficiently. As the front passes Sunday AM a few sprinkle is possible. The big story is to our west as a powerful storm will move through the Rockies and will blast the upper plains with a blizzard. A strong Arctic high is positioned to the NW of the storm which will create dangerous winds. SD and ND are expected 70 mph wind gusts. Max temps will still be around 40 on Christmas Day but we will see a crash right around kick off for the Ravens and Steelers (430 PM). Temps will drop into the teens for most of the region and into the single digits in the interior. It looks like one hell of storm in the center of the country, 1-2' of snow is expected in ND/SD. Speaking of big storms I have to mention a potentially devastating typhoon heading right for the Philippines. The island nation is bracing for a Cat 3/4 storm on Christmas Day. I'll be thinking of the Filipino's and the tough holiday they will have. 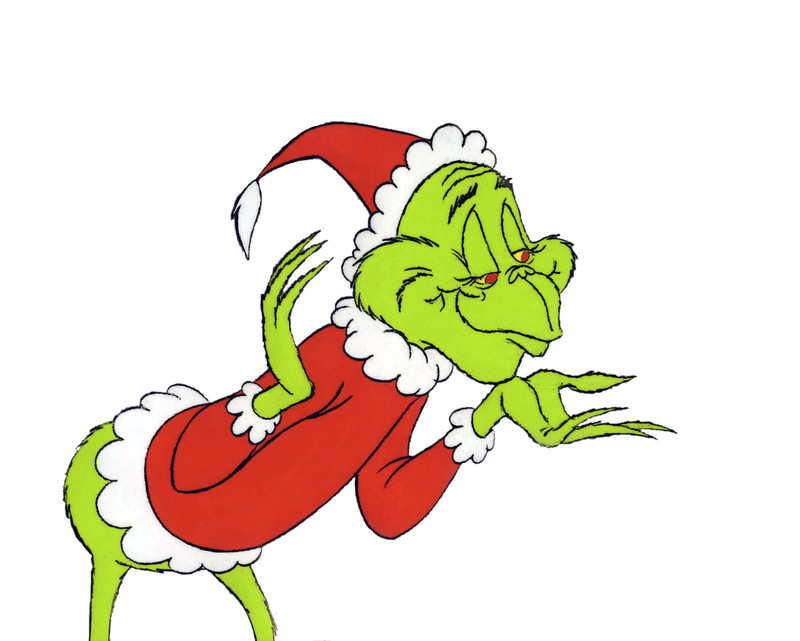 Merry Christmas to all and thank you for making this the best year for the ZG Weather blog yet. It is a cold start this morning with temperatures in the teens. Max temps will rebound into the low to mid 30's which is a few degrees below average for mid to late December. Temperatures will moderate into the 40's by the holiday weekend. Although these readings will be above average they will still be a good 20 degrees below 2015 and 15-20 below Christmas 2014. Snow chances appear minimal through the forecast period. Unless there is a Christmas week miracle there will be no White Christmas in 2016. High pressure is in control for the Northeast US through tomorrow. Our next cold front is just now entering the Pacific Northwest. Temperatures max in the low 30's in Southern Worcester County, Eastern MA, RI an CT. Temps are closer to 30 or in the upper 20's in Western MA and Northern Worcester County. Today is the last full day of fall so there will not be much sunlight to work with in the afternoon to maximize the sunshine. Clouds will also be on the increase this PM. Temperatures will not be as cold tonight as they are this morning but lows still drop into the low to mid 20's for most. We will drop into the upper teens in some parts of Western MA. Winds pick up a bit tonight as a weak front passes. This front will be mainly dry but a pocket of rain/snow showers is possible in SE MA especially the Cape and Is. Temperatures will rebound to the upper 30's/low 40's for Wednesday. Winds will gust 10-20 MPH for much of the day. Clouds will increase in the PM from west to east but not before a mainly sunny start. Min temps are in the upper 20's Wednesday night/Thursday AM. A cold front will lift to the Northeast on Thursday. There will be isolated snow/rain showers during the day Friday but the best chance is in Central and Northern New England. Here is what is "normal" and the extremes for Christmas Eve and Christmas Day. 2015 is well represented here. Everyone wants a White Christmas and then no snow after that (except for students and teachers). Well that just is not how it works. The majority of our snow falls after Jan 1. A strong cold front will cross Southern New England this afternoon. Rain will finish falling late this afternoon just in time for temperatures to crash. The additional rainfall will just top off all of the precipitation we have seen this weekend. There will be slush and puddles on the roads tonight that will freeze if left untreated. Drive with caution tonight. The National Weather Service has issued a Special Weather Statement to address the potential hazardous conditions. Rain will impact the Giants-Lions game in East Rutherford and the Ravens-Eagles game in Baltimore. As the front approaches and passes winds will gust 40-50 MPH in Southeastern MA and the Cape and Islands. The National Weather Service has issued a *Wind Advisory* for this region until 4 PM. The cold front will push well offshore by 7 PM. High pressure builds behind the departing system and cold air funnels into New England overnight. Look at where we could be by 5 AM. 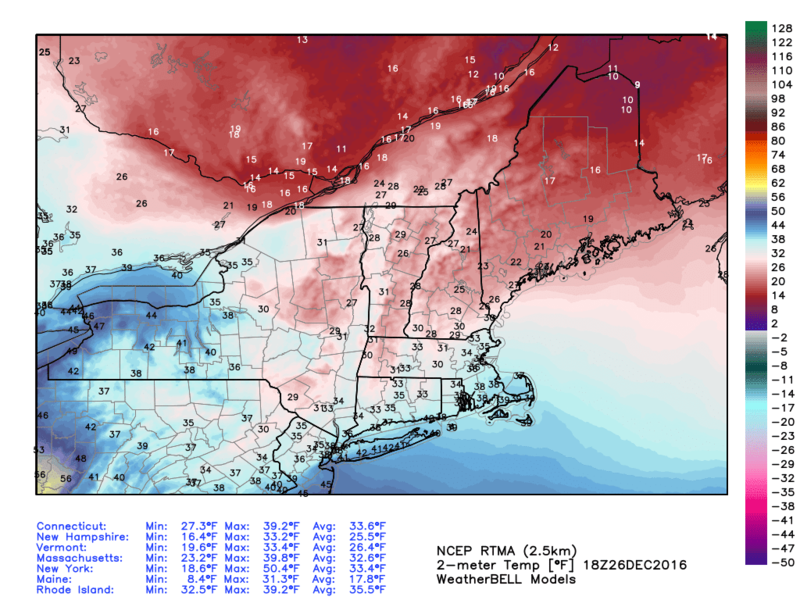 Lows in the single digits are likely outside of SE MA and E RI. The Blackstone Valley is modeled to be in the low teens and not single digits but the bottom line is it will be cold. Highs tomorrow will be in the 20's. Max temps will remain below average on Tuesday but by mid to late week some Pacific air will make its way across the country and temperatures will be average to above average for this time of year, That means low to mid 40's, not the mid to upper 50's/60's of 2015.